2018 is shaping up to be a turning point for federal IT. Over the last several years, agencies have developed a growing range of citizen services with the goal of giving people easier access to information and services through a wide range of channels. These efforts are now shifting into high gear, as agencies increase their adoption of innovative technology, tools and processes to improve the efficiency and effectiveness of digital services and transform citizen engagement. Innovation in this area is essential. Agency leaders are under pressure to meet budget challenges while continually improving the federal customer experience. That won’t happen with traditional tools and tactics. Instead, as part of their broader modernization efforts, they’re bringing in advanced and emerging technologies that both deliver immediate, tangible results and lay the foundation for future government services. This is happening now because leaders in Congress, the White House and agencies across government have a renewed focus on fostering-and funding-initiatives that strengthen federal IT programs through innovative approaches and technologies. 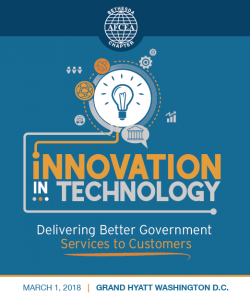 AFCEA Bethesda’s Spring Symposium, Innovation in Technology – Delivering Better Government Services to Customers, will look at how this transformation is unfolding across government. Join us on March 1 as we explore the emerging role of key emerging technologies, such as advanced analytics, artificial intelligence, cognitive computing, robotic process automation and blockchain, and hear from thought leaders from the White House and leading agencies. As agencies expand their citizen services offerings, they need to address key issues that affect the quality, manageability, and efficiency of those services. This session will look at current approaches to modernization and innovation, with a focus on such topics as the customer experience, identity management and authentication, the digital transformation of legacy processes, and more. This panel will include Scott Blackburn, Executive in Charge for the Office of Information and Technology, U.S. Department of Veterans Affairs; Andrew Chiu, Director, Product Management, Internal Revenue Service; and Chad Sheridan, Chief Information Officer, Risk Management Agency, U.S. Department of Agriculture. The panel will be moderated by Gregory Giddens, Co-Founder Potomac Ridge Consulting, and former Chief Acquisition Officer and lead for VA’s Modernization Office. Even as current modernization efforts continue, agency leaders are tracking new and emerging technology that could prove to be game-changers, including AI, cognitive computing, RPA, blockchain, and more. Our IT thought leaders will discuss the potential for these technologies to improve business processes, achieve new levels of cost-efficiency, and to further transform citizen experiences. This panel will include Christine Calvosa, Acting Chief Information Officer, Federal Communications Commission; Jeff Lau, Acting Regional Commissioner, Northeast and Caribbean Region, FAS, U.S. General Services Administration; and Mariela Melero, Associate Director, Customer Service and Public Engagement Directorate, U.S. Citizenship and Immigration Services. The panel discussion will be moderated by David Grant, Co-Founder, Potomac Ridge Consulting, and former Acting Deputy Administrator and Associate Administrator for Mission Support, FEMA. AFCEA’s Spring Symposium will also feature a closing keynote session by Joanne Collins Smee, Acting Director of Technology Transformation Services and Deputy Commissioner of the Federal Acquisition Service, U.S. General Services Administration. Register today to join your peers at AFCEA’s Spring Symposium. 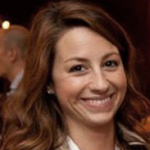 If you have any questions about Innovation in Technology, please contact Katie Desrosiers at [email protected].